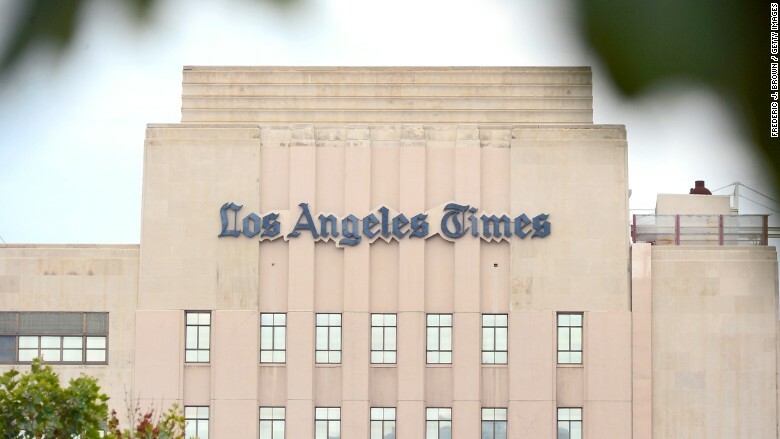 If the editor of The Los Angeles Times was hoping to temper his staff's fears about impending layoffs, the memo he sent on Tuesday didn't do the trick. "We need to accelerate our evolution," Davan Maharaj wrote -- a promising message, Times sources said, unless you're accelerating toward staff cuts. Two weeks after Tribune Publishing's decision to fire the Times' publisher, Austin Beutner, the Times is now preparing to cut anywhere between 50 and 100 positions from the newsroom, a cutback of 10 to 20 percent of total staff, according to sources with knowledge of the situation. Sources told CNN the cuts could go into effect as early as this week. Maharaj's memo was addressed to "Comrades" and filled with buzzwords about meeting the challenges of the digital age. Maharaj also wrote about building "a newsroom around the needs of our audience," and abandoning stories "that have no public-service purpose" and "routine news stories that merely duplicate work that is available elsewhere." The pledge to serve Angelenos and Californians mirrored the ambitions of Beutner, who was hired as publisher just last year and had prioritized building online audiences around core issues like California politics and culture. But few staffers mistook Maharaj's language about reducing redundancies as anything other than the writing on the wall: the cuts are coming. "Over the next few days," Maharaj wrote, "we will announce changes in how we deploy personnel, schedule stories and plan coverage." Times staffers have been bracing for these layoffs since Sept. 8, when Beutner was abruptly fired. His dismissal came because Tribune CEO Jack Griffin feared that Beutner was part of an effort -- led by L.A. philanthropist Eli Broad -- to buy the Times and The San Diego Union-Tribune and take them private, according to more than a dozen Times sources who spoke to CNN over the past two weeks. The Tribune stressed that Beutner was fired because of a poor financial performance and a series of expensive executive hires. The bulk of Beutner's executive team left in his wake. Griffin brought in former Baltimore Sun publisher Timothy Ryan to oversee the Times and the Union-Tribune. In a call with Wall Street analysts on Tuesday morning, Griffin called Ryan "the ideal choice to move our California business forward while building on the journalistic heritage of the Los Angeles Times and ensuring financial success." But Broad and Beutner are mulling another takeover effort, several sources have told CNN in recent weeks. Last week, a group of 50 prominent civic leaders wrote a letter calling for local ownership of the Times, and Beutner himself wrote a CNN editorial on Monday stressing the importance of local journalism. All this is setting the stage for another Broad-led run at an acquisition, sources with knowledge of the matter say. That Tribune Publishing shares are down to just above $8 -- from nearly $24 less than a year ago -- is reason enough to believe that Broad & Co. may find an opening.